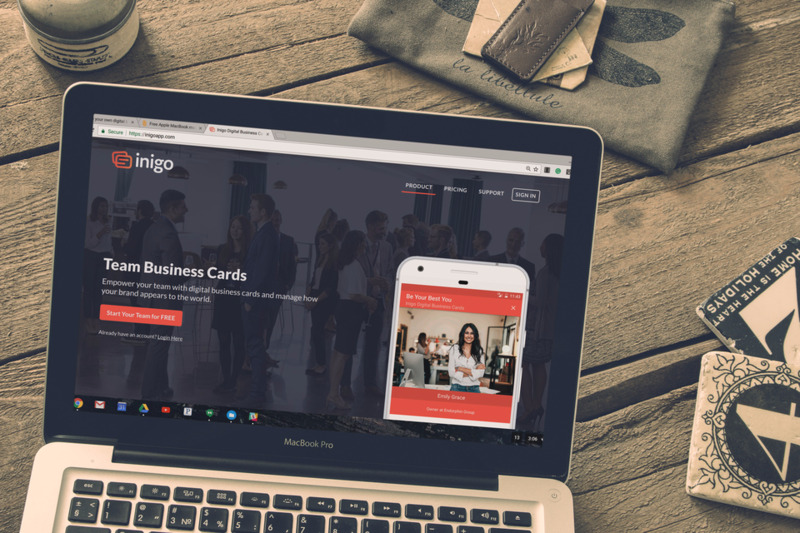 To make business cards for clients, you will create new organizations on Inigo Team that will house your client's business card templates and members. In this guide, we will give you a basic understanding of setting up that organization. If you would like to read more information on creating templates, adding team members, and tracking analytics with the leaderboard, please view future guides. How you conduct this business is completely up to you, we are only providing the platform for you to make something great. Although many types of businesses can be successful at this, the case example that we will provide is a marketing agency that meets with local clients to provide printed advertisements, flyers, brochures, and business cards. Because they already have contacts locally with businesses like car dealerships, insurance agents, and many more, they will have the means to provide Inigo Team accounts to these businesses. Just as this company would design and sell printed items to these customers, they can also design Inigo card templates for organizations that would either complement or replace physical business cards. You must create an Inigo Team account in order to create organizations. For steps on creating a team account, please view this article. Once you create your team account, you can add as many organizations as you would like. Adding several organizations with their own assets like templates, users, and analytics can help you to provide better team experiences for your clients. Your Inigo organization will be your brand. You can add your team members to your own team under your organization and name it to correspond with your business. This will be the landing page for your team members that you add. Add members of your team, or anyone that will be working on your sales and design teams with you. You may add them as managers and allow them to create new organizations for clients. This way, they will be able to add their own clients. To add new members to your team, please go to the main folder in the "teams" page. Click the plus button in the bottom right-hand corner and select "add members." A screen will open that allows you to enter several team members at once. To increase this number, please click "add more." Make sure that you select "send invitations" in order to send a sign up email to your team members. Add new clients as organizations that you will setup and design templates for. To add new organizations, select the drop-down menu in the top right-hand corner of the sidebar menu on the ride side of the page. Select "Add Organization." After selecting this, a text box will appear that allows you to add a name for your new organization. After adding this organization, it will open as a new team on the Inigo Team software. You will see the familiar structure of the team, which allows you to add users and templates. Once your clients are added as organizations, you will need to add the members of that business that will be using Inigo. To answer their questions, please read about joining a pre-existing team. 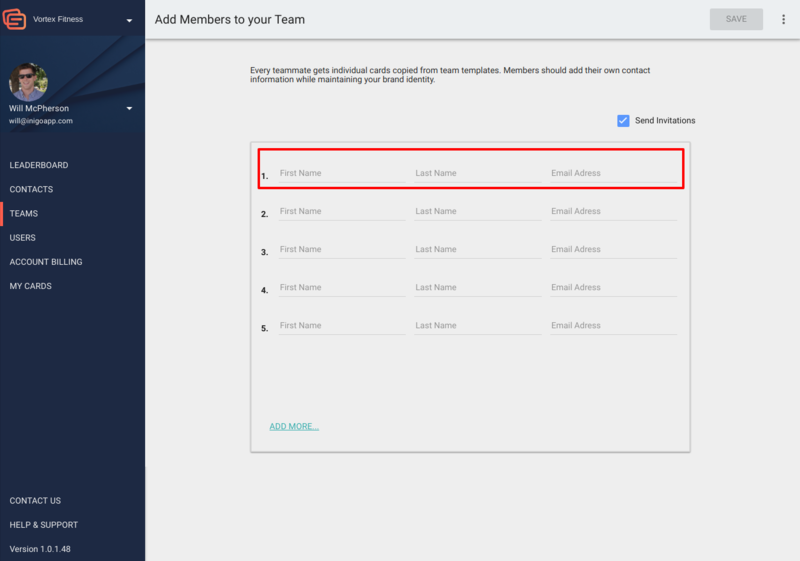 Add these members by going to the Teams page and opening your organization file. Open their main team folder to view their templates and members. Click the three dots in the top right-hand corner to "add new members." To add a user to a sub-team, follow the steps above to add a new user within that sub-team folder. Similar to adding your own employees to your team, you may add the client's employees. You must add every employee that you intend to receive a digital business card. If you would like to add infrastructure to this organization, you may create sub-teams by selecting the folder on the "teams" page that says "Create a new sub-team." 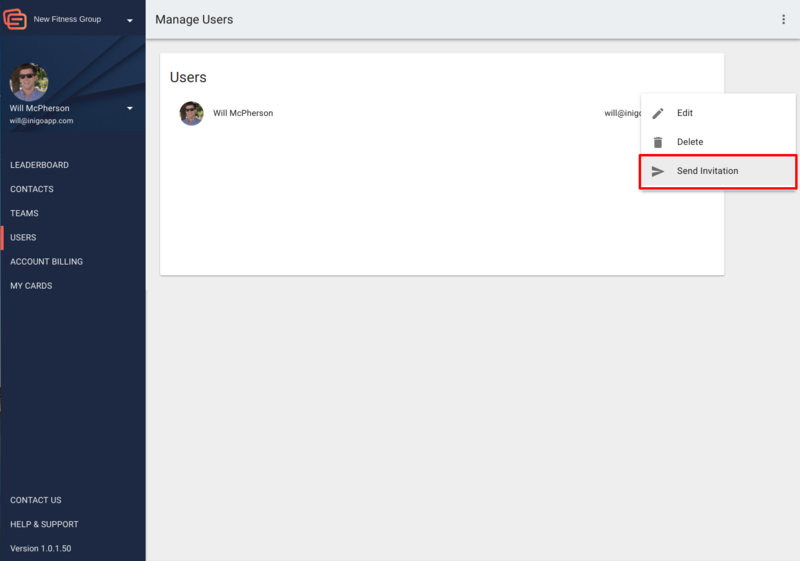 Sub-teams are a great way to organize templates and users within an organization. If you wanted to create two different sets of templates, one for fitness trainers and one for supplement advocates, you could create two sub-teams with separate user groups. 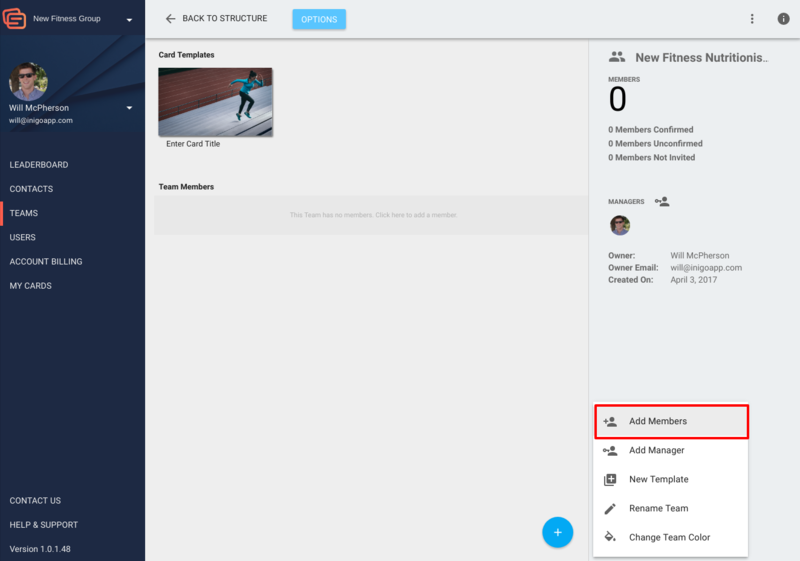 You can add managers to a sub-team at the time of creating it if you would like, but you can also do this later from within the sub-team's folder. To add a user to a sub-team, follow the steps above to add a new user within that sub-team folder. Design new templates for your clients that meet their individual needs. Open the team folder to see the options to create a template on the bottom right-hand corner. Choose "New Template" to begin designing a template. Remember, to add a template to a client's team, you must go to their sub-team first and repeat the steps above. Templates will appear for the team folder that they were designed in and every sub-team beneath it in the structure. To add templates specifically for sub-teams, open the corresponding folder and follow the steps above. 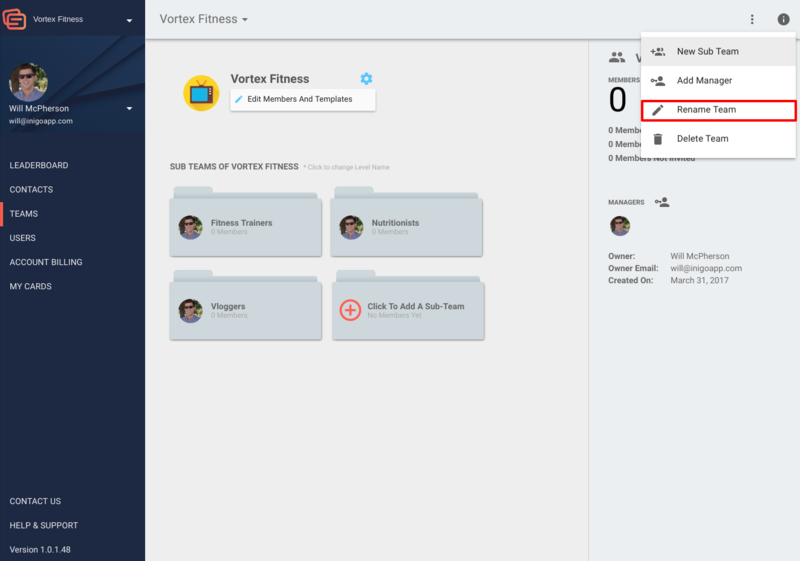 Remember that these templates will contain general business elements and that individual team members will add their personal contact information from the Inigo App. To learn more about setting up your Inigo Team templates, please view this article. Step 8: Send the members their new digital business card for them to use! 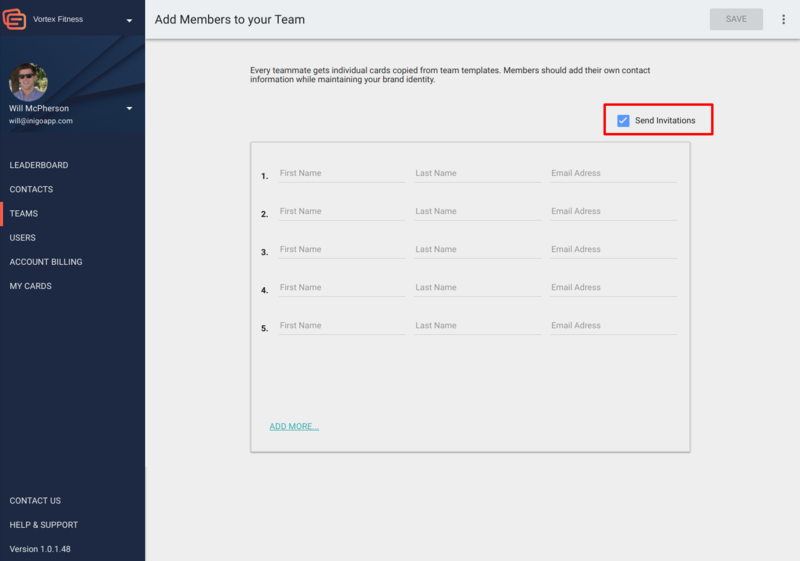 When you add members to a client's team, you have the option to click "send invitation." If you select this option, then the employees that will receive digital business cards have already received a sign-up email from Inigo. If you would like to add new members, please go to the team page that corresponds with the team or sub-team that you wish to add them to, and click "add members." When you fill in the information, make sure that you select "send invitation." If a user has already been added but did not receive the confirmation email, please view their confirmation status on the "users" page by clicking the three dots to the right of their name. For further information about Inigo Team, please view this article collection.